New Delhi, India -- After he was enlightened, Buddha was walking down a path and he was completely glowing. He was shining. He was effulgent. He was what sufis call "munawwara" (radiant, effulgent). A man came up to him and was so taken by the light, he asked, "Are you a celestial being, or a god"? He answered, "No". And then he said, "Well, then you must be a magician". "No". "Are you a man"? "No". "I am awake. I am Enlightened." 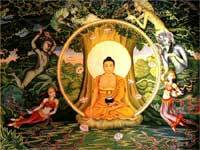 The one who reached the awakened state, which eventually how he would be later known to world history, 'Buddha' (the word meaning the awakened one) - Siddhartha Guatama (563 - 483 BC) is recorded to have prophesied about how long his original teachings will last and that was 500 years. In the past, every new age the world is gifted with world teachers. In some religious tradition these world teachers are known as messengers, prophets or apostles. In other tradition they are called great sages, master teacher, avatars, paramavatars etc. No matter what they are called, all major nations of the world in important turn of history has given birth to great spiritual masters. And in all ages, each teacher brings new teaching, reforms old pattern of thinking and behaving and replace all that is out dated. Its very interesting that Buddha himself prophesied how long his teachings will last in its spirit or originality. They come at a certain important juncture of human history and transmit different facets of truth / Truth which is needed of the time. Without exceptions every teacher's teaching by the very nature of time and human history becomes teaching of the past. Yes they certainly carry certain universal truth which are timeless, yet on the social, personal context many of the practices given to hold those teachings become outdated after certain period of time and thats when the next master (or masters) of the age arrives and renew the teachings. Its very interesting that Buddha himself prophesied how long his teachings will last in its spirit or originality. And this prophesy comes in even more interesting context which is when there was a question raised by Buddha's closest companion, Ananda, requesting to allow women to be ordained as nun in the Sangha (spiritual community founded by Buddha). I quote from Barbara O'Brien's article 'The First Buddhist Women' via About.com: Maha Pajapati Gotami was the sister of the Buddha's mother, Maya, who had died a few days after his birth. Maya and Pajapati were both married to his father, King Suddhodana, and after Maya's death Pajapati nursed and raised her sister's son. Pajapati approached her stepson and asked to be received into the Sangha. The Buddha said no. Still determined, Pajapati and 500 women followers cut off their hair, dressed themselves in patched monk's robes, and set out on foot to follow the traveling Buddha. When Pajapati and her followers caught up to the Buddha, they were exhausted. Ananda, the Buddha's cousin and most devoted student, companion, found Pajapati in tears, dirty, her feet swollen. "Lady, why are you crying like this?" he asked. Ananda sat at the Buddha's side and argued on behalf of the ordination of women. The Buddha continued to refuse the request. Finally, Ananda asked if there was any reason women could not realize enlightenment and enter Nirvana as well as men. Ananda had made his point, and the Buddha relented. Pajapati and her 500 followers would be the first Buddhist nuns. But he predicted that allowing women into the Sangha would cause his teachings to survive only half as long - 500 years instead of a 1,000.